As you may have noticed, I tend to update my existing outfits as I find new gear that I like or decide on a color palette change. 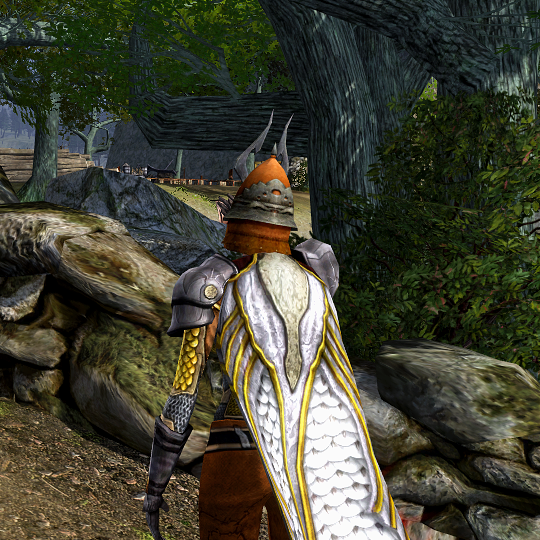 Muiriol got some cool shoulder guards down in the Dunbog, which include a so-far-unique collar piece. The gauntlets are also from the Dunbog, and they seem a little beefier that the earlier set. 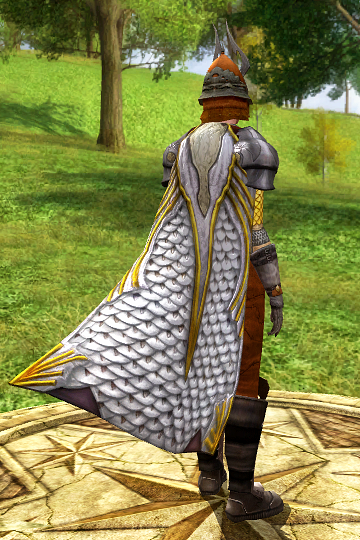 And she received a (literally) shiny cloak from a quest in the central area – from one of the Barnavon mine quests. Its color would blend pretty perfectly with the other pieces if I dyed it grey, and I may do that, but for now I prefer the way it glints in the light. 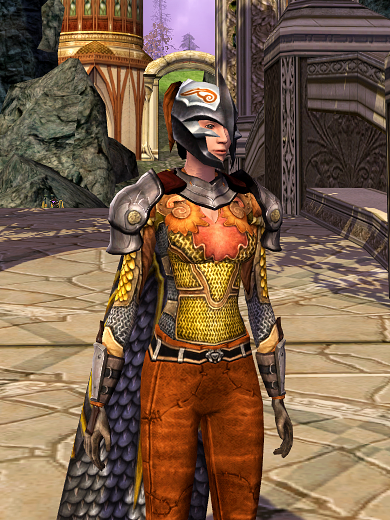 ETA: After running to a skirm camp to upgrade my skirmish traits, I took a gander at the cosmetic barterer’s offerings. 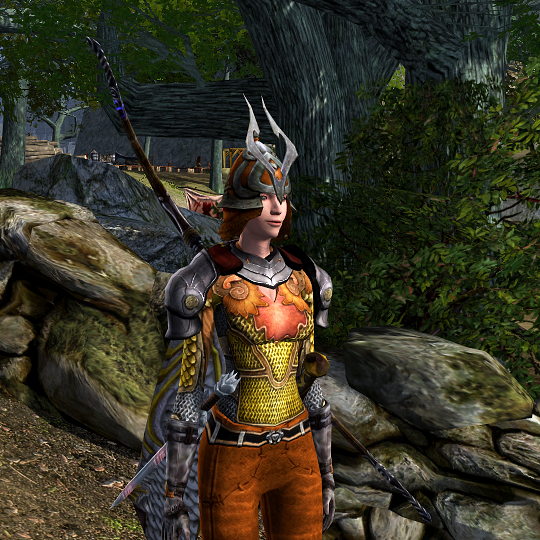 As a result, Muiriol is wearing a new helm that feels appropriate for moving on from the Dunland towns to Rohirrim camps, even if it was originally an Angmar piece (Ceremonial Helm of the Gloom-bane, orange). 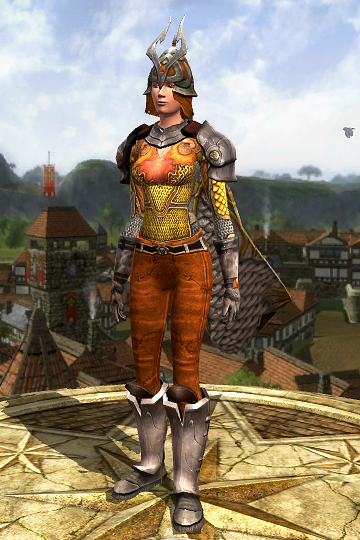 I swapped the gauntlets while I was at it, because the ones above have a clipping issue (that orange ‘accent’ is actually the shirt showing through); so do these (Gauntlets of the Charging Stag, undyed, Dunland quest reward), but they do better at making it look intentional. 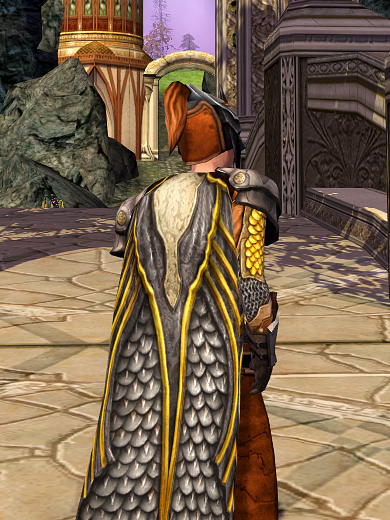 And dyed the cloak grey, because darker suits a helm like that. That helm has fangs. 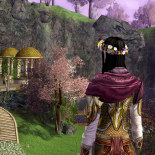 This entry was posted on 2014.04.07 by vyh in Outfits and tagged bright, champion, cosmetics, dunland, grey, lord of the rings online, lotro, muiriol, orange, outfits, silver, yellow.